The Prince of Wales is the crown jewel of Niagara-on-the-Lake, Ontario, a place that feels more like a village in the English countryside than a Canadian town less than an hour from Buffalo. 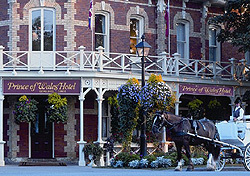 Consistently ranked as one of the top hotels in Ontario, the Prince of Wales was named in honor of King George V, who stayed at the property in 1901. Today, the hotel stills feels like a regal abode. An Old World feels pervades the hotel’s amenities as well. High tea is served from noon to 6:00 p.m. in the Drawing Room with a selection of teas from around the world, finger sandwiches, and fresh scones. There’s also an English-garden themed spa and a lounge that Hamman says “is reminiscent of a gentleman’s library.” Escabeche, the hotel’s flagship restaurant, highlights local wines and dishes made from local produce. Sommeliers are on hand to help make selections for wine pairings. The Prince of Wales’ 110 guestrooms and suites are decorated with antiques and traditional brocades and tapestries, but still have modern touches like wireless Internet and heated towel warmers. A nightly turn-down service includes a rose placed on each bed. Room rates range from $175 to $225 CAD ($158 to $230 USD).